In this topic on modeling the packet-pair dispersion in a multi hop network with hop- or path persistent (independent or correlated) cross traffic. The proposed framework describes the dispersion curve which can be observed via a packet-pair measurement through the network path where the background traffic is approximated with the fluid model. During a packet-pair measurement one injects probe packet pairs with a precisely set initial separation and interested in the separation between the probes at the receiver node. In this scheme we can capture the trace of the interaction between the probe packets and the momentary background traffic. 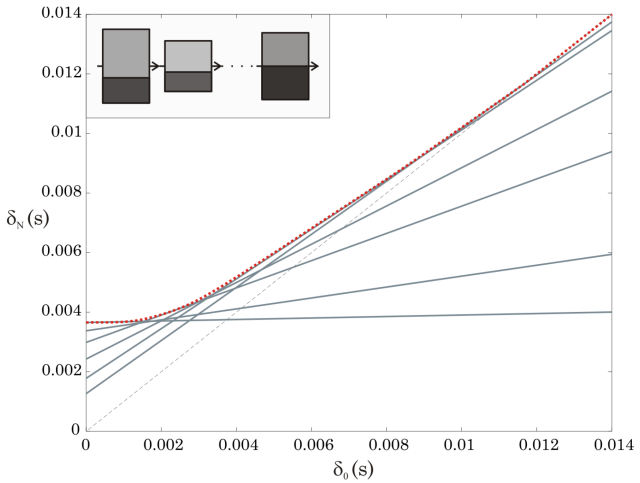 The increase of the probe packet separation, which can be easily calculated after capturing the probe packets, tells us important information about the network path properties and the statistical properties of the background traffic. These measurement techniques are widely used for inferring various network characteristics, like link capacity, available bandwidth, queuing delay, etc. The traffic flows can be represented by a traffic matrix B. A Bij matrix element represents the cross traffic entering at ith hop and leaving at jth hop. The traffic matrix is an upper triangular matrix, whose Bii diagonal elements represent the single hop persistent traffic flows. The physical capacity of the links along the investigated network path is represented by the Ci vector. A usual approximation in the analysis is the single hop assumption of a network path. This means that only one, the most relevant network hop is taken into account (with its C capacity) in the investigations. Only a limited number of studies try to deal with network paths containing multiple relevant hops, but all of these approaches are based on independent, single hop persistent traffic model. 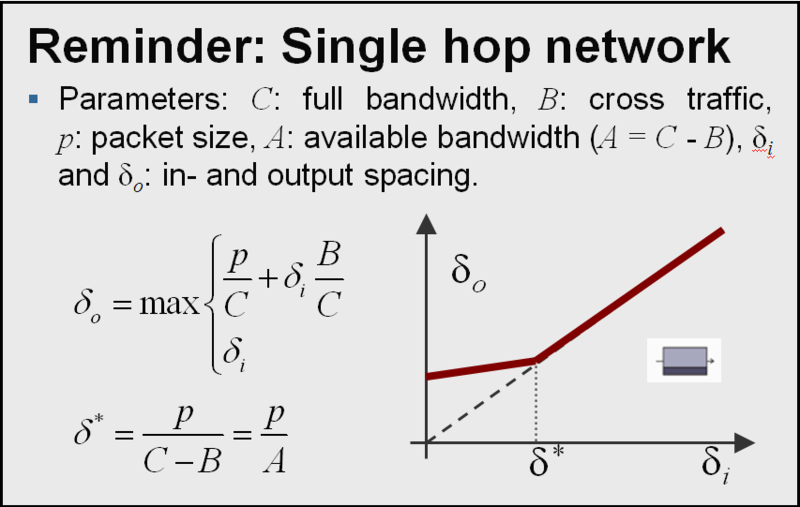 Single hop persistent traffic is one of the most widely used assumption for background traffic. It means that the background traffic flows are considered as independent traffic flows which are persisting for only a single hop without any correlation and overlapping between them. In that sense we have to distinguish between single hop persistent and multi hop persistent flows. Single hop persistent traffic exit one hop after they enter the path, while multi hop persistent traffic travels a given number of hops. Traffic flows belonging to the earlier are also called independent, while flows belonging to the later are called correlated traffic flows. 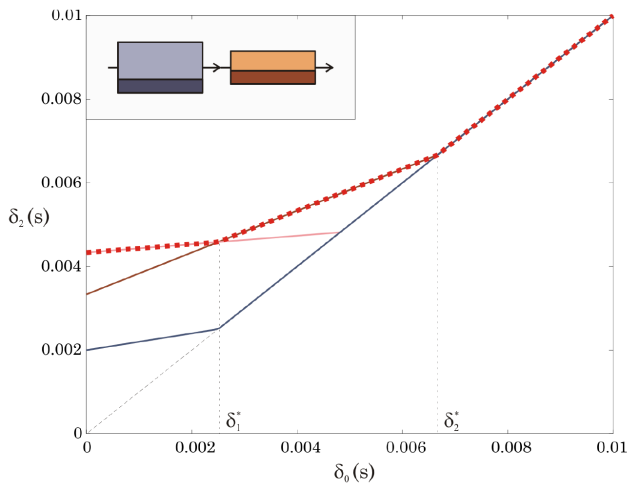 In this work we focus on modeling a packet pair measurement with traffic flows that are entering and leaving the measurement path at arbitrary places. In general the traffic flows can be represented by a traffic matrix B. A B_ij matrix element represents the background traffic entering at ith hop and leaving at jth hop. The traffic matrix is an upper triangular matrix, whose B_ii diagonal elements represent the single hop persistent traffic flows. The physical capacity of the links along the investigated network path is represented by the C_i vector. 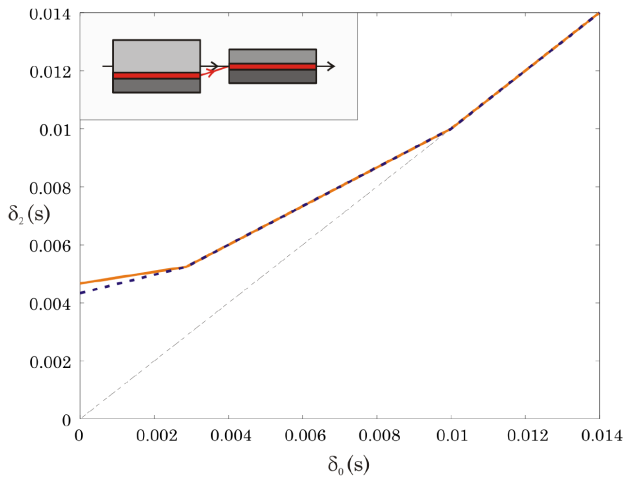 The goal of this paper is to develop a model to describe the packet pair dispersion curve, which describes the interaction between the probe packet pairs and the background traffic flows. We found that for systems containing two hops the packet pair dispersion curve can be written in a closed form, even in the case of arbitrary background traffic matrix. For network path containing more than two hops we present an iterative solution, which evolves the probe packet separation hop by hop. This is done by counting all the traffic flows entering at a given hop or just passing it (since they entered some hops before). The multi hop persistent traffic requires extra care, since they not just increase the probe packet separation, but also behave as pseudo probe packets (whose size are equal to the volume of the enclosed fluid traffic) as they are enclosed by the real probe packets. We introduced the effective probe packet, which is a joint packet containing the real and the pseudo probe packets. The size of the effective probe packet also evolves during the iteration process according to the traffic matrix and the previous probe packet separation. With this formalization we are able to derive an iterative solution to determine the packet pair dispersion curve hop by hop. The iterative process utilizes the probe packet separation before the actual hop and gives the separation after the hop. The dispersion curve is parameterized by the probe packet size p, the capacity vector Ci, and the traffic matrix Bij. In this way we are able to determine the packet pair dispersion curve for arbitrary network paths with fluid background traffic flows, which can enter or leave the system at arbitrary hops. This approach enables us to understand the importance of the background traffic correlations and give insights to the network traffic patterns.